Die Nadel im Heuhaufen (the needle in a haystack) is created in a small edition in 2001/2002. 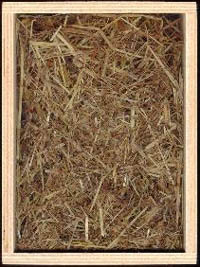 This saying became reality in a 18,5cm x 13,5cm x 8cm sized wooden frame which is completely filled with hay. A pin with a coloured head can be found at the glass sheet in the front. Beside the word-playing aspect it's a very aesthetic work. During the same time Geld wie Heu and Original and copy were created.